Inter Milan’s problems under Walter Mazzarri continued after the team failed to win for a third straight match. Despite this disappointing result, Mazzarri claimed that the players should remain positive in order to get success. It was a disappointing evening for the club after they were leading 2-0 at half-time, but they conceded two goals in the second half only get a point against Livorno. Considering that this match was against the relegation threatened team, Inter Milan have dropped more praise response as they are struggling to even qualify for the Europa league. Mazzarri was expected to improve the fortunes of the team dramatically after they have been struggling in recent years under the managerial reins of Claudio Ranieri and Andrea Stramaccioni. However, the former Napoli manager has failed to keep up the form of the first half of the season. He says that this has been one of the years where everything seems to go against them. According to him, it is imperative that the players stayed positive during such troubles and only then they can take advantage of the good times. Inter have slipped three points behind Fiorentina in the fourth place with seven matches remaining in the campaign. The club’s last win was against Hellas Verona in the middle of March. “Those who saw the match realise that it’s one of those years. We just need look at it in a certain way. We need to take the positives from the game. My players showed a lot of character until, perhaps unconsciously, they thought that the game was over. Livorno were given a new lease of life after their first goal. We should have put the game to bed at 2-0 and we missed two or three big chances at 2-1,” said the manager, whose team next take on Bologna at home. Inter Milan recently appointed former Napoli manager Walter Mazzarri as their new head coach. Immediately after taking over, it was expected that Mazzarri will be making few changes to the first-team in order to make them competitive once again. Inter are coming on the back of a very disappointing campaign in which they finished close to the bottom half of the table. They will be without any form of European games this season, which Mazzarri reckons will be a blessing in disguise for the team because they can concentrate on the league. Mazzarri has taken a look at the squad up until now and he is extremely happy with the players at his disposal. He will also be able to call upon the services of players like Diego Milito and Javier Zanetti, who are nursing long-term injuries. He has promised that Inter fans can look forward to some attacking and pulsating football this season after a couple of years of drab football. Inter Milan have strengthened their forward line up by bringing in the likes of Ishak Belfodil and Mauro Icardi. Even though Mazzarri arriving at the club has raised expectations that Inter Milan will finally be able to get back into European football, the manager has not promised anything as of yet. “I want a team that people enjoy watching, with a soul, that never gives up. And I can promise you that. People are free to assess the potential of the team, but it’s my job to convince the players that we can win every game. I haven’t had individual chats with all the lads yet but they’ve exceeded my expectations. They’re determined to bounce back. I prefer actions to words. And I get the impression these players are going to give me everything they’ve got,” said Mazzarri. The Inter Milan manager Andrea Stramaccioni is currently under a lot of pressure after recent results in all competitions, which has left him facing the sack. Inter Milan have not only fallen behind the likes of AC Milan in the race for the top three positions, but they are also on the verge of being eliminated from the Europa league as well. The 3-0 defeat against Tottenham in the first leg of the Europa league encounter between the two teams has all but confirmed the exit from the competition. 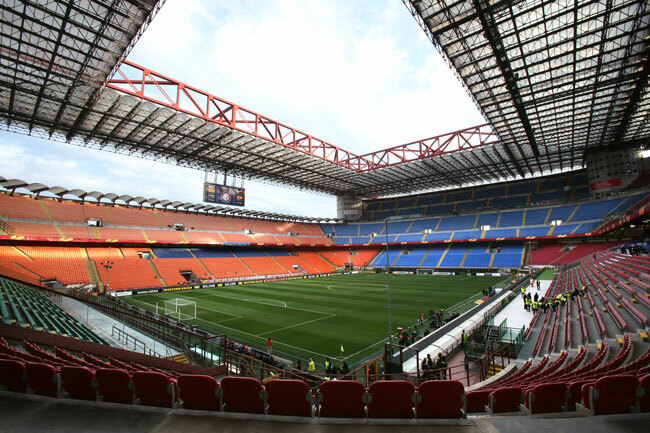 The return leg will be taking place at the San Siro, but not many are giving the 2010 Champions League winners hope. The 37-year-old has always enjoyed a special relationship with the Inter Milan President Massimo Moratti. The team has managed just three wins in the last 12 league matches. This abysmal run of form has meant that they have not only been caught up by their arch rivals AC Milan, but Massimiliano Allegri’s men have also overtaken them as well. Inter are currently in the fifth position – five points behind the rivals Milan, who occupy the third position. Inter Milan were set the objective of finishing in the top three in the qualify for the Champions League season. There have been rumours that Stramaccioni might lose his job, but the 37-year-old has said that he does not worry about it. “I think that my work will be judged at the end of the season and not now. I’ve always had the president’s (Massimo Moratti) backing, but he is in charge and can make whatever decisions he wants. My future will be decided by the results at the end of the campaign, not by one game. I never give up, I’m focused and giving everything that I have,” said the former youth team manager. The Inter Milan manager Andrea Stramaccioni has expressed his confidence that his team will be able to finish in the top three positions the season. Inter Milan are currently fighting to get back into the Champions League after missing out on this prestigious European competition this season. The team has been undergoing several changes since winning the Champions league title in 2010. Stramaccioni has been given the task of getting the team back into the top three, but Inter Milan are a few places below from achieving their objectives for this season. They are a few places below the top three with just more than half of the season played. Due to the fact that there are several games remaining in the season, Stramaccioni has expressed his confident that the team will be able to achieve Champions league qualification at the end of the season. Even though the team has managed just one victory in the last five matches, Inter Milan are only three points below the third placed Lazio. Stramaccioni has said that despite not having the best of starts to the season, he is pleased by the good form shown by the team both domestically and in European competitions. He has confirmed that his team will remain fighting mode till the end of the season. “I don’t think we had a positive start to the campaign. We struggled to gel due to so many changes in personnel, but from week five onwards we laid the tactical foundations which brought us a run of good results both in Italy and in Europe. Then our results tailed off, but I strongly believe we are a good side who had a bad run, rather than an average team that had a good one. I think my Inter side will be in there fighting until the end of the season. Our results will ultimately determine that,” said Stramaccioni.